Jah Works #2: Music - 200th Blog! "Think about how many songs you have stored in your brain," I remember telling my co-worker Angie during some down-time while working at Baskin Robbins. "Is there a better way to spread ideas than through music?" I said, with a hopeful glint in my eye. Okay, maybe I didn't have a glint in my eye -- after all, I couldn't see myself in the dull reflection of ice cream-stained plexiglass -- but I imagine that I did. I was finishing up high school at the time, and getting really into music. 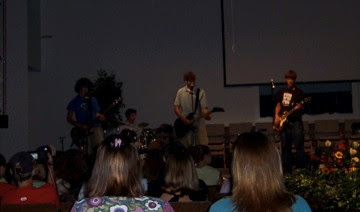 My punk band, Minus the Standard, was a lot of fun, and we were actually playing some small shows. Even though the end of high school and different colleges brought about the dismemberment of what I'm sure was to be the next MxPx (Who is MxPx?, the collective readership asks...), I was all about music and investing most of my graduation money in a new guitar, amp and pedal board. I was also writing some of the best songs to-date, though I had no avenue to share it. Fast forward twelve years and most of those songs have still not been heard by human ears. Music has been a funny journey for me. I got started playing the viola in 5th grade, thanks to my aunt who kept hers from when she was in middle school. The thing was old, smelled bad and was too big for me, but a friend of mine was playing in the orchestra, so I wanted to be there too. It's funny how God lines up things like that, because, had I played the violin, that would have very likely been the end of my musical career. The big thing to do at my elementary school was to try out for the School of the Arts, which I did, for both Visual Arts (drawing, painting, etc.) and Orchestra. I think I was only one of about three people who auditioned for the viola, but one of a hundred for art. I wasn't all that great at viola, but where there is great need, those with lack of talent flourish; and so when I didn't get into the art program, but was accepted into the orchestra, I wasn't about to turn them down. In the orchestra I made friends with a skinny violinist named Eric, through whom I later came to know Christ. He was sold out on Jesus and I, a moderate church-goer at the time, enjoyed our interactions. We were into the same Christian bands, Five Iron Frenzy, Blindside, Switchfoot, and so when his church went to Creation Festival 2000, I couldn't wait to go. Little did I know that God was working on my heart, taking me down a path in pursuit of popularity in the months prior that brought me away from God. That summer I was ready to admit my need for him, and accepted Christ on the first night of the music festival. 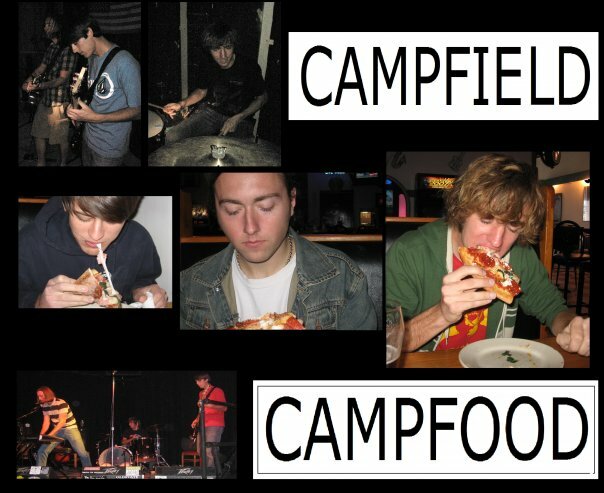 I later picked up drums and bass guitar, playing in a band after college called Campfield with one of my best friends, Chris and our drummer Roger (a good friend now, but I didn't know him well at the time). The whole time I was writing songs independently, but the one thing I wasn't doing much of was singing. I had a public speaking professor in college tell me I should try singing, based on the tone-quality of my voice, but I dismissed her. Others gave me the chance, but it was something I just couldn't bring myself to do, outside of quiet recordings in meager attempts to get songs out of my head. The idea of hearing my own voice just jolted me, made me uncomfortable, terrified me. It still does most of the time, actually. One big moment in the midst of this was when we were going to Ecclesia Church in Hollywood. A expert on prophecy came in one day and gave a talk on how to hear from God. Then he concluded by going through the crowd and pointing out people he thought God had given him a word for. After several folks, mostly agreeing with what he said, he took a look at me and said, "You in the blue shirt...I've been avoiding you." I don't know why he said that, but whatever... "I just see the word 'music' over your head, does that mean anything?" I played it cool, but the thought excited me. Music? God wants me to do music? Film was my interest at the time, with music certainly being a part of it, but never the focus. I left that day encouraged, but also a little lost. "Music" is a big topic and can mean a lot of different things. Which did it mean for me? Anyway, the Sunday morning service went okay and I sang in public, "Beautiful Things" by Gungor. I later went on to sing a few more times at the church, mostly during our "Folk Sundays" (I picked up the banjo and harmonica during this time too), and they all went fine. My voice was weak, unrefined. I struggled with pitchiness, which is a cardinal sin I remember, from all those early American Idol episodes I watched with my parents as a kid. During this season, I had a mentor who God very clearly placed in my life. We met a few times in his amazing house on a hill overlooking the ocean in San Juan Capistrano, with the purpose of helping me find what God wanted me to do in life. As he looked at my life map, with all the ups and downs I had detailed, he quickly concluded, "I see music all over this thing." I agreed, but didn't know what to do about it. "Can you lead worship?" he asked. "Not well," I replied with honesty, and it was true. My voice is pretty deep and most worship music is for the masses. We pressed on in our course with only the conclusion that I should probably work in ministry and in music, but that conversation always stuck with me. About this time I was a stay-at-home dad and had a little more time to invest in creative activities. Also about the same time, my friends Alex and Arne lost their jobs, and so with our increase in free time, also came a lot more recording. I was writing more music than ever, having spent much of my commuting hours the two years prior recording songs onto my cell phone while driving. Combine this with all those years of writing and not showing, and I had quite the list of songs. We recorded a lot, one of us watching Ellie in the other room while the other sang or played. It was fun, and a lot of creative stuff came out of it. The drive to play live during those two years was also there, but I never could bring myself to get out in public and play something. About that time, I had a telling dream. I was standing in what seemed like the busiest street that runs through Hermosa Beach, not too far from where we lived. Over some kind of loud speaker, on the radio, I heard one of my songs playing, but it wasn't me singing. I then heard a voice, or felt an impression rather: "If you don't sing these songs, someone else will." My next thought was one of insecurity, and then, Well, even if I don't sing, at least I know they are good enough to be on the radio. The impression was so clear that I know it was from God. A couple years later I had another dream, again pushing me into music. And so, here I am, all these years later and still mediocrely pursuing the thing that God seems to have been pushing me into all along. What is wrong with me?! Insecurity, fear, logic -- it doesn't really make sense that anything could come out of my voice. I'm really not that great of a singer. But hey, if God tells you to do something, you do it, right? That is why music is part of this website, even though most of my blogging has been about God, fatherhood and surfing in the past. I am reading a book my wise wife gave me called Restless by Jennie Allen, and it is bringing all of this stuff about music back up in me again. So far Music has been like a wandering companion, one of those friends you see for a while and connect, and then don't see again, often for years. The next time he drifts into your life, it feels like no time has passed and you immediately enjoy each other's company; but just like that, in a season he is gone. You know you will see him again sometime in the future, but you don't know when. Well, this time I'm hoping Music stays. I regret the days of setting aside something God has so clearly placed in my heart and am working now to explore the reason he put it all there. If you have read this far, thank you for investing even that much in my journey. I will work hard not to disappoint, as I clumsily navigate these steps of realizing what I have to say and what it means for the world to hear it. After all, music is one of the best way to spread ideas, right? By the way, this is the 200th blog post I have published! Thanks for those who have been reading since #1, and those who just jumped in. I always appreciate a listening ear and attentive eye. I hope you have enjoyed reading as much as I have enjoyed writing all of it! Oatmeal is really difficult to clean up, by the way, in case you haven't had experience doing so. When you wipe it, it just kind of dissolves and mushes further into whatever surface you're cleaning. Also, it gets in your kids' hair and won't come out. I have learned, through not a few messes with our first kid, that it is best to cleanup in process. Just handle one thing at a time and then go to the next. Clean her clothes first and then wipe her off. Shut her in a room (part of her punishment) and then start at the floor, working your way up to the table. One of the hardest parts to all of this is finding the little unexpected places where said mess found itself. Today it was on the pile of unfolded clean clothes in the corner. After it was all done, and I began to make my breakfast (not oatmeal), I realized that I pretty much managed to keep my cool during this one. Sometimes these things will get the best of you, and you will find yourself yelling, pulling your hair out, asking your children and God, "Why?!" But today my response was a stern reprimand for Waverly, and then a step-by-step cleanup process. Now they are watching TV while I am recounting the whole thing for you, faithful readers, my blood pressure at a normal level and hopefully no minutes removed from the end of my life due to stress. And so I think the takeaway is this: messes will happen inevitably, but they will be cleaned and life will go on. It's nice to be able to give your kid a hug after it is all said and done and move on with life with no hard feelings. Reading genealogies in the bible can be daunting. Sometimes you wonder why they're even there, but trust that someone, somewhere has derived a spiritual benefit from them in some way. I've been reading through Chronicles, and the first part is a pretty hefty genealogy. There are some lines in between the hard to pronounce names that tell a little story, but for the most part it is tough to get through. Today, though, the Holy Spirit brought out a couple things to me that I'd like to share. From this verse we can see that God answers the prayer of those who trust him. It says that outright actually, so no meditation required there! It begs the question, though -- how much do we trust God? Katie and I have been looking for a place to live; a house and also a city that we really feel at home in. It might be where we are, or maybe somewhere else (or maybe nowhere on this planet!). In the home buying process, there is a lot of stress and competition, particularly in a city like Charleston, which has hit about every "top destination" list out there. In the midst of all that stress and anxiety, I have to ask myself two questions found in this scripture: do I trust God to get us the right house, and is this battle even ours? Throughout scripture you will find places where the battle is God's. Sometimes this is a literal battle, but others it's a search, an internal struggle or spiritual forces outside of our realm; ultimately, our sin is the greatest battle that we strive to fight (through good works), but isn't ours to conquer (Christ already did it on the cross). So think about the things you are going through in life and ask yourself those two questions, and then take the answers to God and see what he has to say about it. I have had way too many dreams that I have been hanging out with famous people. Owen Wilson, Taylor Swift, Zac Efron...twice (total honesty here). I also like watching those late night shows where famous people talk about random things. (Maybe it's not a coincidence that I worked for E! Entertainment for four years...) So obviously I have some draw towards being famous, or at least being associated with fame. A friend once asked what I wanted in life, and I replied, "To be a person of influence." That makes the desire for fame sound a little more honorable, but it's still there. Since then I have learned that every one of us already has a sphere of influence that God himself designed for us, so the mission is already accomplished I guess. The more we are together, the more I realize that I am dependent on my wife for certain things. She always buys the shampoo and tooth paste (and we never run out). She plans vacations. She knows how to make popcorn in a pot and not in the microwave. There's nothing wrong with being dependent of course, but as I take on more responsibility as a parent, I am finding that there are things I should know how to do that I just don't. Those are silly examples, but the fact of the matter is, particularly in regards to dads, that it is easy to let our wives take on more of the parenting responsibilities when it comes to day-to-day activities. Katie tells me about moms she meets all the time that complain about their husbands' ineptitude in practical parenting skills. And so I want to take this time to encourage any dad readers out there that you can do more! You can and do play an important job in parenting your child! To do so will just take work and the desire to learn about your kids and what they require to make it through a day. But therein lies the problem: It's easier to let your wife do "mom things," while you go and earn that paycheck, thus fulfilling your duties as dad. Not so, dads. Providing for your family means much more than putting food on the table. You are valuable for more than that and are certainly able to do it! I don't write this to demean or simplify either role in parenting -- food on the table is necessary -- but I write rather to encourage dads to stretch themselves in ways that they either thought weren't possible, or were content not trying. Your family will appreciate the extra effort and time, and I think you will find the progress rewarding as well. I ran into an old friend today who said he had his three kids all week long due to his wife being out of town. "I don't know how to do anything," he said. "The school had to do my daughter's hair today!" To that I say, "It's okay." I commend him for stepping up and not dropping off the kids at grandma's for a week. To him I also say, "You can do it! "You are more than you think you are. You are strong and courageous. You are patient and competent. You play a part no one else can: you are Daddy. Kids are really different. This becomes more apparent when you have more than one, of course. Our first learned different words at a different rate, walked later than the second, is a much more fluid dancer but also a little less adventurous. She also used to hate going to bed (still does most of the time, though it's not as bad as it used to be); but once you got her to bed, she was out for the night. 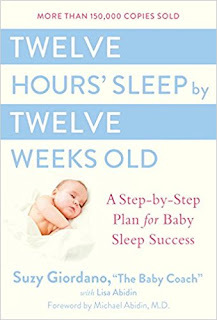 We got this book, 12 Hours Sleep by 12 Weeks, which was recommended from a work friend. I think it took 14 weeks for us, but it pretty much made the difference. However, once you put her down, you usually had to go back in a few times to comfort her before she would actually pass out. Yeah, maybe we should have just let her "cry it out," but sometimes it's hard to take the sound for more than a few minutes. Conversely, our second child was extremely difficult at first, in regards to sleep. 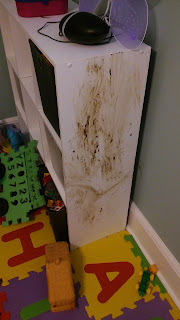 To be fair, we were in a 2 bedroom apartment and were putting her to bed in our room, and then transferring her to a pack-n-play in the living room once we were ready to sleep. Naturally, that didn't last long and we decided to move across the country to solve the problem (sleep deprivation will take its toll). After a few months, she actually went to bed really nicely. By the time she had her own room, you would hold her for a few minutes and then she would actually lean into the crib to go to sleep. However -- and this is a big however -- she would wake up several times a night. Not always, but about 85% of the time, our sleep would be broken up by a crying kid in need of a pacifier. Once she got the pacifier, it was out like a light for a few hours most nights. But then there were the odd ones where she would wake up 5-7 times. Exasperated, we would try and take turns, though who is keeping score when you're in the middle of a deep sleep cycle and can barely tell what's going on outside of your own head? And then the other day my wife mentions that Waverly is almost two years old and still not sleeping through the night. Really? Wow... I thought, as it hit me that Ellie was far past this point at her age. Like I wrote, kids are different, but man, shouldn't she be sleeping soundly by now? For our sake and hers. Age kind of gets away from you after the first child. For your first, you are acutely aware of each month and milestone. "Oh, she's 7 weeks old...14 months..." Then, after two years, it kind of dies down. Of course, we had Waverly when Ellie was 21 months, so maybe we just couldn't keep track anymore -- I have heard mothers say her child was 32 months before...c'mon, that's too much. Anyway, two nights ago, my wife decides to leave a closet light on with some books in Waverly's crib when we put her down for sleep. She typically fights this time of night, her energy really boosting once the lights go out. But on that night, she didn't make a sound outside of "reading" her books. The night went on, she slept, and that was that. It's been three nights of this, and it has worked every time. And so I wanted to write this whole thing to encourage all the parents out there to keep experimenting when it comes to your daily routines. Don't just accept things like a bad sleeper or a child who won't eat vegetables, because there might be a solution that will save both of you a lot of heartache, and will likely be healthier for everyone in the long run. I guess the same thing applies to life outside of parenting, so if that's you, congratulations for reading so far into a blog post about parenting, and hopefully it is now worth your while! Nap time is never a guaranteed thing at our house. My wife very cleverly started calling it "rest time," so our oldest could play by herself in her room while the youngest slept, also giving Katie some time to relax before the afternoon craziness that would inevitably come. I have tried to keep rest time going during my tenure as the stay at home parent, but it is becoming increasingly difficult. Ellie started getting into an Amazon show called Creative Galaxy, which is a fun little cartoon that encourages kids to approach problems through creativity. At the end, it shows live action kids doing art projects, which always inspires Ellie to do the same. Suddenly, rest time has become "art project time," which involves a constant interruption for paper, scissors, crayons, glue, etc. I think of myself as a pretty creative guy, so I hate to stifle her own endeavors, but it is cutting into my own time, which is when I usually write or do house projects. So this has been the little daily battle that has been going on while my youngest slumbers away peacefully. I usually try to play with Ellie a little and then shut the door for rest time, but she always retorts with, "But Daddy, I'm not tired." I assure her that it is important to be by yourself sometimes as a means to rest, but "introvert" is a word that means nothing to her right now, so this is typically futile. Eventually, I shut the door and she becomes sad, eventually playing quietly until she needs more paper to cut and a refill of tape. 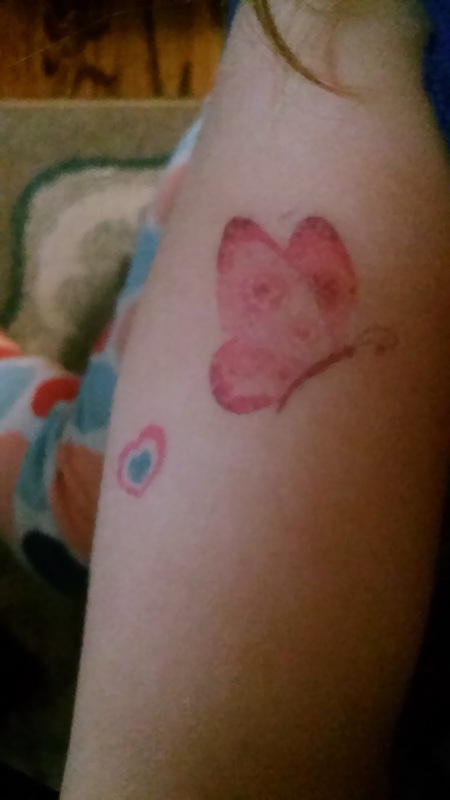 Today was much the same, but when I told her it was rest time, she got very somber and hugged my leg. "What do you want, Ellie?" I asked. "Daddy, I just want you," she replied, and squeezed a little tighter. The words melted me, and I laid down to play for another 15-20 minutes before calling it rest time and coming to the computer to write this blog post. These were powerful words coming from my three year-old, expressing what is likely one of the deepest desires of her little beating heart. But they struck me deeply as well, because I think that's exactly what God wants to hear from us; though if I'm honest, it's rarely what I want. Sure, I want to know God, and I know the more I get to know him, the more of him I will want. But there are so many things in this life that I also want, that overshadow his relationship far too often. It's the worst kind of eclipse -- one that happens every day -- the beauty of creative pursuits perverted as they take the place of the only thing that can truly fulfill, the only One who can.